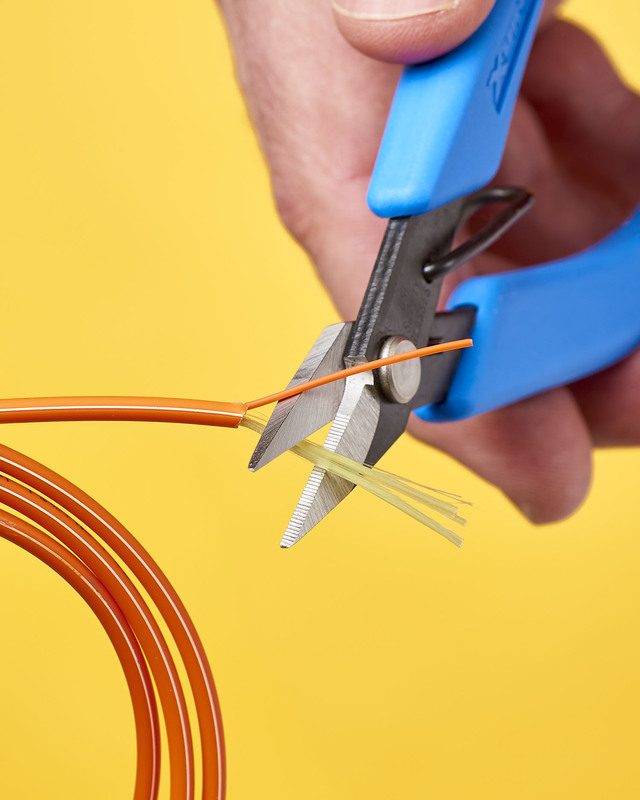 A precision scissors that is designed with a special serrated cutting edge for gripping slippery aramid high tensile cable insulation fibers and a sharp edge for cutting them is available from Xuron Corp. of Saco, Maine. Xuron® Model 9180 Kevlar® Shears feature a special serrated cutting edge designed to grip and hold slippery high tensile Kevlar® fibers and a sharp edge for cutting them. Incorporating tapered tips for penetrating cable jacketing, cushioned soft rubber handle grips and a return spring, these ergonomically designed scissors eliminate conventional finger loops. Comfortable to hold in either hand, large or small, Xuron® Model 9180 Kevlar® Shears are ideally suited for assembly, production, and field service applications. The cutting edges are heat treated to Rc 58-60 and provide exceptional cutting and long-life, claims the firm. Xuron® Model 9180 Kevlar® Shears are priced at $24.50 (list) and are manufactured in the U.S.A. A complete catalog of precision shears, pliers, and assembly tools is available upon request.